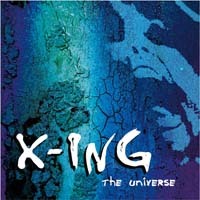 X-ING is a Melodic Progressive Rock band from Germany. I would hesitate to classify them as Heavy Metal, although there are some heavier influences. There are definitely influences of classic prog bands like MARILLION and GENESIS, although thankfully they are not as derivative as some of the neo-prog bands of the past ten years. The song lengths are kept to a reasonable level and for the most part and boast a typical verse-chorus-verse etc structure. This may be a detriment to those who like their prog noodly, lengthy and complex. Personally, I did not find it to be too simplified for the genre, sometimes it is best to avoid trying to do too much with the material written. I would much rather hear a well-written straightforward progressive song than one that meanders off for ten minutes and accomplishes nothing. Things stay, for the most part, consistent throughout. There are no instances of falling into the same musical rut, song after song. The real detriment to “Crossing the Universe” is that nothing really sticks out and makes a permanent impression on me. While listening to the album, I enjoy what I hear, but there is nothing afterwards that would make me want to listen to it again unless I forced myself for the purpose of the review. This is not to be completely damning. “Crossing the Universe” is still a well-made album and I would still encourage fans of progressive music to give it a chance. However, for me it just is not good enough to merit a high score.